Rope moldings are a great accent for crown moldings, drawer fronts, cabinets and furniture. Our rope trim moldings are made on precision machines by craftsmen who take all the care needed to produce a very high quality product. Our wooden rope moldings are finish sanded so that they can be shipped as an “assembly ready“ product. We make a broad range of sizes from 3/8″ to a maximum of 13 inches in diameter. The 3/8″ piece can be purchased as a whole rope or split in half. The sizes up from that can be purchased as a 1/4, 1/2, 3/4 or whole rope, whichever you prefer. 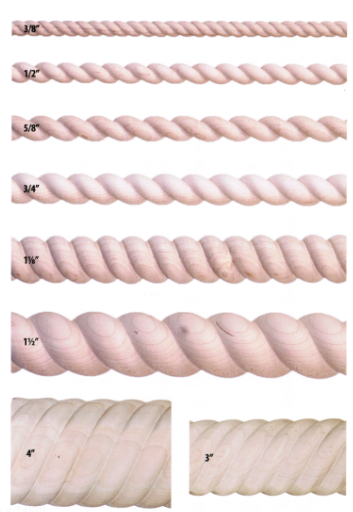 We have a core group of wooden rope moldings that we produce and inventory, shipping directly from inventory every day. We routinely ship via FedEX Ground as a cartoned product allowing us to give great service and short turn around time as a result. There are no minimums to an order so you can ship one piece in a carton or 75 (more?)! it’s your call! Species available includes: alder, ash, cherry, hickory, hard maple, soft maple, red oak, poplar and walnut. Other species may be available. Rope trim mouldings can be designed into load bearing columns as well. Not many manufacturers can make rope moldings this large but we like to provide customers with a wide range of possibilities in order to meet the greatest spectrum of needs.